“We as entrepreneurs build a business to have control so we can to do the things we love. Unfortunately, after so much hard work and sacrifice, business owners realize the limited control they have over their outcome when they go to market without a plan. Sara and her story provides an amazing example on how owners can regain the control they always wanted and create a successful exit that has many options! The goal is freedom and happiness. 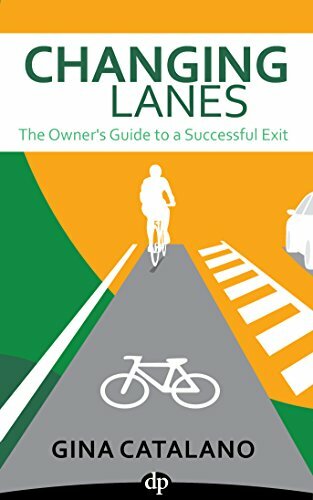 Changing Lanes is a must have resource for the journey! "Passion, vision and emotion are important elements in building successful businesses, particularly family businesses. In this engaging business novella, Gina Catalano provides business owners with invaluable insights into how to deal with these important elements to successfully transition from their business. Gina's carefully structured and beautifully written book is a significant contribution to the body of work on business exits and transitions." “As she did in Tandem Leadership: How Your #2 Can Make You #1, in Changing Lanes, Gina Catalano shows you how having a strong team in place can make you and your business more successful. With the help of a mentor, our fictional heroine, Sara Berry, is ready to sell her business but is disappointed to find out that her business isn’t quite worth what she had hoped. With the guidance from a mentor and a renewed passion for her business and her life, Sara is able to successfully ready herself for the future. From my own perspective as a CFO and entrepreneur, Sara's story carves an actionable path to the most hassle-free migration to the owners' realization of the highest value for her business." Having spent 25+ years in the consulting and coaching business, I have witnessed firsthand that most business owners don’t know what they don’t know when it comes to selling or succeeding their business. Remarkably, Gina Catalano has written a book that will appeal to most owners trying to decide when and how to sell. Her unique writing style masterfully weaves a compelling story to simplify the process helping them to effectively plan for their future. A quick read that checks all this subjects boxes in a sometimes-misunderstood process. Every entrepreneur will benefit from reading this book! It’s perfectly written and illustrates the problems and challenges entrepreneurs likely have in their business -- especially the ones they are not able to see yet. Every entrepreneur can benefit from riding along side, Sara, the main character, on her journey to discover what is next and uncover what has been missing that has left her feeling uninspired by the dream she worked so hard to create. The story perfectly shows how not being prepared for selling your business can have a detrimental impact on the money you walk away with but also on your happiness. The guiding questions at the end of each chapter give the reader a way to easily reflect on their own business. Gina Catalano has done a superb job in Changing Lanes at providing value for businesses to better plan and execute their long-term vision and business exit strategy. This hands-on framework will clearly help owners and business leaders achieve stronger results with a clearer roadmap that includes specific tools to help make it happen. If we could simply re-set America's businesses to start with the end in mind, the economy would gain enormous new prosperity and productivity while the value of individual businesses would sky-rocket; especially at that most critical moment of eventual business exits.